Sometimes we’re hardest on those things we love. I absolutely love Yoshi, as I have since the release of Yoshi’s Island. Which brings us to today’s review of Yoshi’s Crafted World. No matter how hard I try, I always feel compelled to compare each new Yoshi release not only to the one which preceded it, but the one that started it all. Which sets an awfully high bar, since no game has eclipsed the original, though Woolly World came the closest. But before we start comparing apples to delicious apples, it’s only fair to cover what Yoshi’s Crafted World does well, before we tackle what it does wrong. 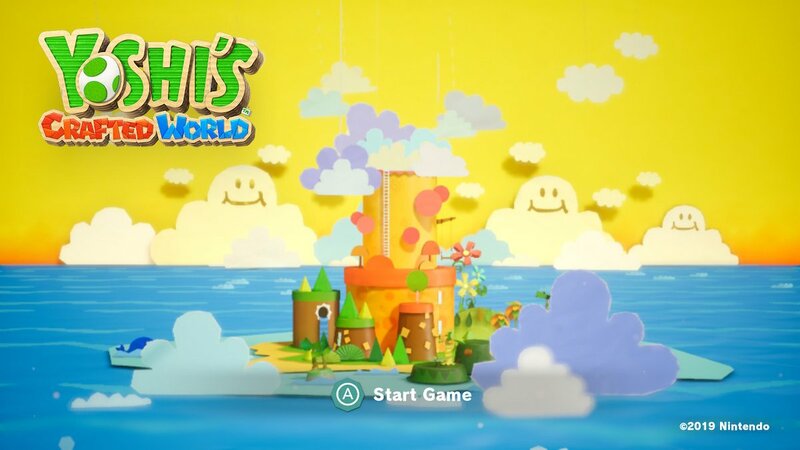 Much like every other Yoshi game, Crafted World’s plot is the least important part of it. But that doesn’t mean it doesn’t have its high points. Sure the premise is the same “Kamek does something bad, Yoshis go to stop him and Baby Bowser”, but the way it is executed has some charm. There’s adorable cutscenes that show the baddies scheming, as well as some almost claymation style sequences right before boss fights. As soon as you understand there is no mystery here, just a two dimensional motivation to get going, you’ll enjoy the game a lot more. And while the premise is certainly simple, there’s an air of childlike wonder to it all that makes it enjoyable for gamers young and old alike. In this game, Kamek steals the wish-granting Sundream Stone that, for some inexplicable reason, was left in the care of the Yoshis. Or rather, Kamek tries to steal it, and the resulting tumult sends the stones set into the artifact flying. Whoever can collect them and put the artifact back together first will be granted a wish, and you can bet Baby Bowser’s demands aren’t healthy. Thus, you pick your flavor of Yoshi and get started on this adventure. As far as how the game controls, it’s pretty much what you expect. You can flutter jump, aim, ground pound and eat enemies to make eggs. I appreciated that there were a variety of control options, since the initial setup wasn’t what I wanted. Instead, I picked one that more closely resembled what I remembered from Yoshi’s Island. They really simplified the aiming, and instead of the reticule bouncing back and forth, it will just aim in whatever direction you want. You can still bounce eggs off things, you just will rarely have occasion to. 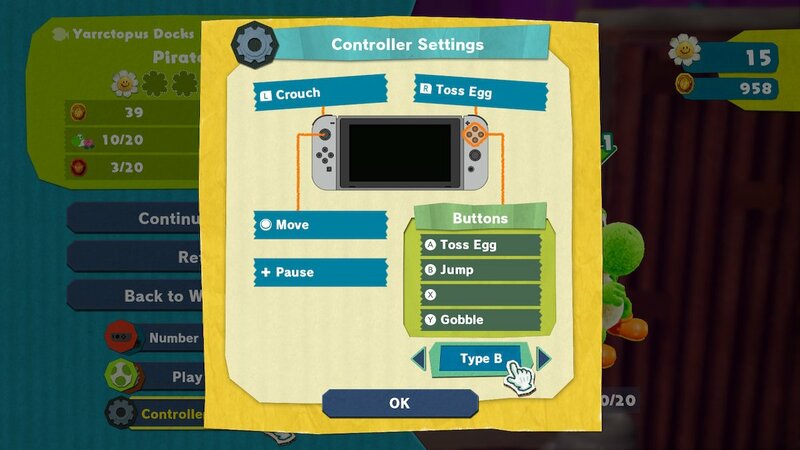 As a tried and true Yoshi fan, I went with Type B controls. Like Woolly World before it, Crafted World is arranged with a distinct visual flair. Instead of yarn, this one is mostly about paper crafts, though there’s a huge variety of other influences. There are bouncing origami flowers, springy macaroons, giant magnetic soda cans and much more besides. In a weird way, aesthetically this almost reminds me of some of the Chibi-Robo games, with real world items making up strange landscapes. It’s all delightful to look at, especially since Good-Feel did their level best to make no two worlds the same, meaning there’s a ton of visual level variety. Another way this apes its predecessor is that the levels are incredibly content dense. Besides finding all the Flowers, Red Coins and Heart pieces to 100% a level, they also have other ways to stretch out your playtime. And trust me, it can take a while just to find all those. Most levels I couldn’t find everything the first try, and many I’m still missing stuff after exploring them multiple times. You’ll also be able to play the flip side of stages, which is essentially just playing them in reverse. Though it’s cool to see the stages from another angle, thankfully they added something to make them a little more interesting. That special sauce are the Poochy Pups. Yoshi’s loyal hound has always been entertaining, but their puppies are even crazier. The little psychos run wild at the start of the flip side stages, and your goal is to find them all in a specific time frame in order to get rewarded with more Flowers. You have to find them and then hit them with an egg to make them follow you. Better yet, once they do, they act as a sort of infinite egg, and once tossed will boomerang back to you. As if that wasn’t adorable enough, when you flutter jump, they will hover as their little tails wag furiously. Lastly, the other aspect that makes each stage a lot more extensive than you’d expect are the Souvenir hunts. You’ll come across these strange cardboard robots whenever you unlock a stage, and afterwards, they’ll have you find carefully hidden crafts in stages. Though these are optional, once you find them, you’ll be rewarded with even more Flowers. By now you’re probably wondering why you keep getting rewarded with Flowers. The good news is, they actually serve a purpose. They unlock stages, and the farther you get, the more you’ll need. I actually liked this feature, since I hate when you are forced to collect a bunch of items for no real reason in other games. Having said that, I wish getting all the Red Coins did something other than give me more Flowers. I would have loved if they unlocked extra stages or something similar.